Since I've had a few people ask me how I get the red on my jetbikes and really my Vypers, I thought I might post this explanation. Keep in mind, I'm only going for a quick, table-top finish on these guys. It's not quite a full-blown tutorial but a simple step-by-step on how I get the look I have. First step it to prime the model black. Then I go through and paint up the non-red areas (like the pilot and anything metal). Second step is to basecoat the red areas. I don't think it matters what "red" you use really. I use an off-brand of paint for all my stuff. The big part of this is that this red is OPAQUE. This is important because too many coats of a TRANSPARENT red will result in a loss of detail while you try to work up to a smooth finish. Third step is to go in and wash down the model. Here I use the good stuff... the GW washes. Delvan Mud for all the red. Badab Black for all the black and metal parts. I put it on fairly heavy overall. The only thing I have to be careful of is leaving streaks on the red, I try to make sure I don't have any. I'll go back and add a little more Delvan Mud wash around things like the gems and other elements I want to really stand out though. Fourth step is to add the highlights on the red areas. In this case, I have another off-brand red that I use that's slightly lighter and purer in color than my basecoat. More importantly, it's TRANSPARENT. If it was opaque, this wouldn't work as well. 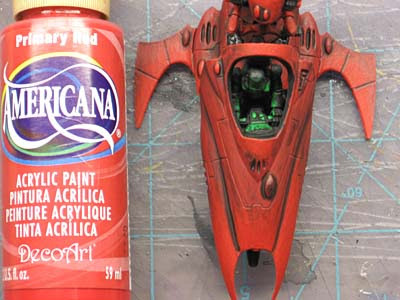 Since this color red is transparent, I can paint it on over the washed down basecoat and I can build up my highlight. I don't need to thin it or anything. It takes about 3 coats to get the pure red highlight color. With each pass I make along the nose and edge of the wings, I don't go as far as the previous layer. 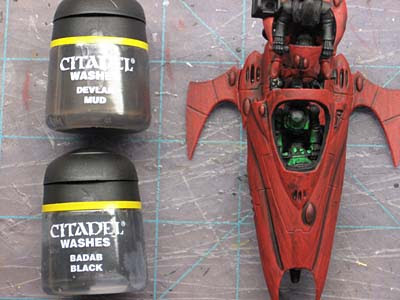 This helps with the blending of the highlight color into the washed basecoat. Add a few details and you're all done. Here are the two I have done so far, one more will finish off the Squadron. Part 2 of working with red can be found here. 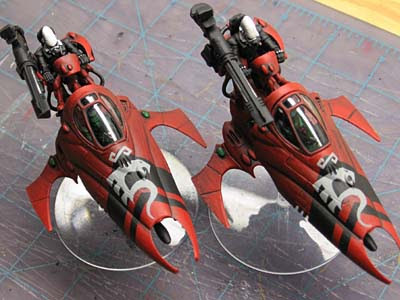 It's sort of a next generation article that shows how my painting red has progressed. And it really is as easy as that! What a stunningly good method mate. The more I look at my half finished Saim-Hann, the more I think I might just restart from scratch. If I do I may well pinch this method. They look really nice, good write up. I should add that the green glow of the instruments is brilliant and well executed. sovietspace: Painting them like this gets them done fast, sure you won't win any Golden Daemon awards but you end up with a fairly well done and FULLY PAINTED army in a short time. oni: Thanks but I can't take credit for the instrument panel glow, I saw it in some artwork and thought it looked really cool. For such a simple process you get a surprisingly good red - how long does it take you to paint these guys up? A single Vyper? Maybe 2-3 hours total including all the time to let the paint dry. They go really fast (no pun intended)... I'm working on my third today and I'm blogging while I let paint dry. Really nice work. The picture's are almost as good as up close and personal. 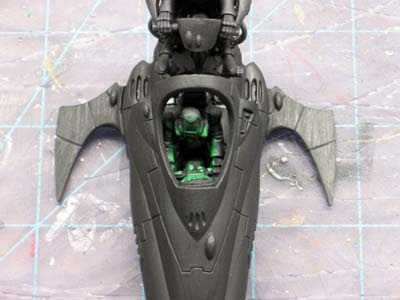 One question though, since I have no art knowledge, how do you tell opaque paint from transparent? Great stuff Ron. Glad to see you liking the washes. @Kevin: Usually, the opaque paints will mention "Opaque" on the bottle. In Ron's example, the label's a bit faded, but it's there. Also, you can water down paints to get a transparency you like. Master Darksol is right, usually they will say right on the bottle. In those instances where it doesn't say, what I've done is take a small piece of cardstock to the store with me when I go (I but my stuff at Michael's) to try them out. I'll put a little dab of paint on my finger and swipe it on the card. If you make a black line on the card before you go, the paint you put over the line will tell you what kind it is. If it dries and you CAN NOT see the line, you've got an opaque color. If it dries and you CAN see the color, you've got a transparent color. Nice tutorial, i will keep this in mind if i need to paint anything red. Great work on these models they look very realistic and well weathered. I'm totally going to borrow that driver paintsheme trick it looks awesome! That explains much. A tutorial within a tutorial. A win! Kevin: It's a mini-tutorial. They're free when you read all the comments and not just the post. CJ: The pilot color scheme is fast and since I only have a tiny bit of green on the wings, it helps balance out the contrasting color a little more. You got those paints at Michaels? That top one looks like it might be for ceramics. I never thought to look in that section. Doctor Zero: Michaels has a huge selection of colors. It really keeps me from having to mix colors to get the shade I want. I do stick to the "regular" acrylics though... nothing fancy like the ceramic paint. And most of them are only a dollar or so for a bottle. Anon: The black line (under the serpent icon right?) is just freehanded on there. I would be too afraid to try and using masking tape for fear that it would pull off the paint underneath when I tried to take it off. It's not hard to do (paint the lines freehand) if you just take a second and use landmarks on the Vyper body to keep your lines straight. Thanks for that quick tutorial Ron, I'll use that when I finally get around to painting my Space Hulk BAngels. 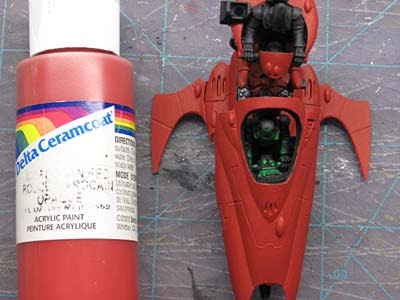 That red Ceramcoat is what I'll be using for the carapce armour on my nids, after basing them with the Army Painter's bone spray. I'll be picking out details with some sort of green then dipping in Minwax. Fun! This kind of tutorial is very easy but I appreciate your effort for posting. Tuxedos: Thanks, sometimes it's the simple things that get us. Tutorials like this are designed for people to get an idea of how I do my work. Most folks may already have a set formula, but seeing something like this could prompt them to try something new.